Down at ground level, you can feel the action. There are about 600 of us working with purpose: Let’s get the competition site ready for opening day next week. You don’t see anyone sitting around unless they are eating lunch or catching a nap so they can work another few hours. The level of energy is intense, and all the activity fills your senses with excitement. The truck carrying Team Florida’s house reached Washington, D.C., and is scheduled to unload tonight. That’s the good news. The bad news is that they are now three days behind. The team members are ready to go and undaunted. We have had teams arrive three days late in previous competitions, and they still did well. We are all pulling for you, Team Florida. One of the most amazing assemblies is up at the Team New Jersey lot. A 100-ton crane is lifting huge sections of its low-cost concrete house in place. The design is stunning—and heavy! It makes the ideal seashore house a cool place to live with no worries when a hurricane comes ashore. Check out the Team New Jersey website if you want to know more. I’m sure we will be talking more about this house and team before the competition is over. Autumn is in the air. Tomorrow is supposed to be in the 50s and 60s. After the hot, humid working conditions we experienced the past two days, the fresh, cool air will be a welcome relief. Great building weather! 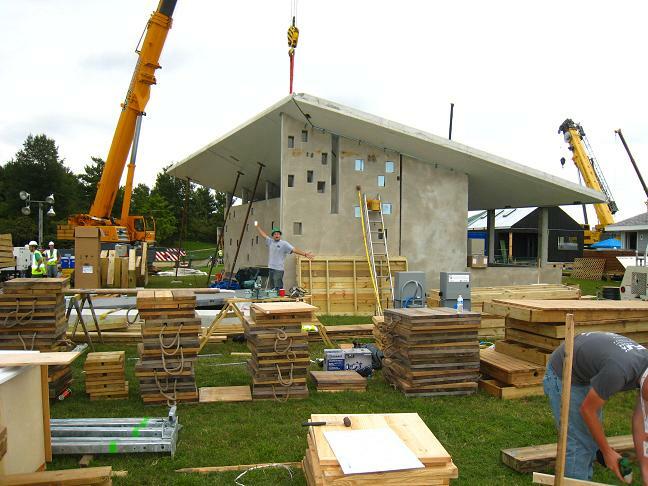 This entry was posted on Thursday, September 15th, 2011 at 9:12 pm and is filed under Solar Decathlon, Solar Decathlon 2011, Team Florida, Team New Jersey, Teams.